In slow motion, I fell. So many people say similar incidents happen in slow motion. They really do! I recall thinking, "When am I going to hit the ground?" It actually seemed to take longer than expected. Meanwhile, I was basically riding the ladder down at least half way before falling to the ground. Impact. The crash took out 3 snowmen lights guarding our little flower box area beneath the front window. A portion of the cement edgers for the flower box was knocked flat. I sprang to my feet with the weird mental rush that I hoped no one saw the incident and that I needed to get up quickly to convey that I was alright. How silly to think that before even assessing my damage. Pride kicked in immediately. Nothing felt broken or mangled. Then, my eyes locked on my right hand. The top portion between the knuckles and wrist was swollen a purplish-red-blue and clearly raised. I wiggled all my fingers without much pain but I wasn't sure if my hand was broken or at least fractured. I collected the ladder to take inside and noticed the folding arm on the right was warped. Repairable, but confirmation of the direction the ladder fell. 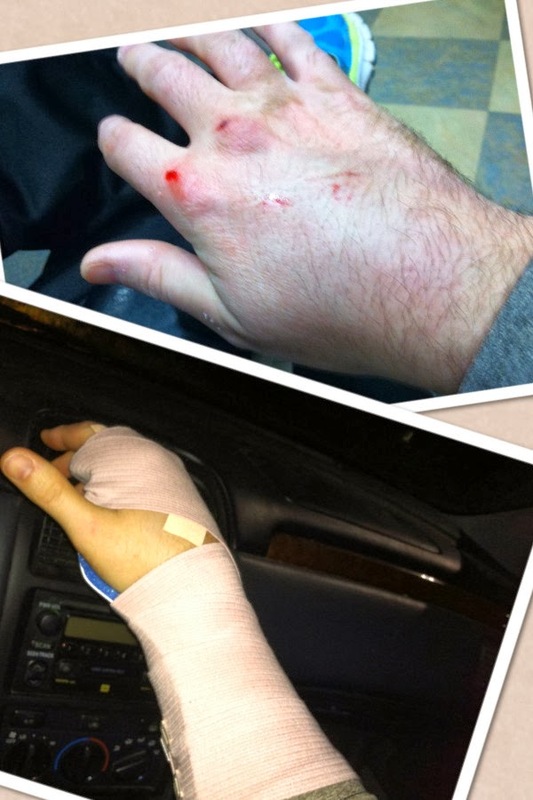 Keeping an ice pack on top of right hand reduced the discoloration and some of the swelling. This wasn't one of those moments to wait and see or tough it out. This needed to be X-rayed. Going to Patient's First in Columbia probably wasn't the best option as it took me three hours from the time I checked in until I left with a splint. However, going to the Emergency Room at Howard General seemed extreme and could've taken just as long. The X-rays showed no breaks or fractures and the doctor praised my putting ice on the injury so quickly. He determined the injury was a hematoma but recommended an aluminum splint for some added comfort and some Ibuprofen. My record for no broken bones remains...unbroken. I'm very blessed to not have injured myself more severely. However, the bruising and soreness is setting in as I have a a bruise on my right collar bone and a sore right bum. Seems like the right of me took the most beating! Today, the breech in the roof was sealed. Victory is mine. Time for some egg nog. Yikes! Glad to hear nothing is broken. That damn squirrel has been nothing but trouble!